1. Editing the configuration file. 2. Using Text based or Graphical based Network Utility. 3. Using the Command Line Interface. In this article, we will see how to configure network IP Address on RHEL7/Centos7 using nmcli command line interface. nmcli is the advanced command line interface available in rhel 7/centOS 7. Note: Install bash-completion package to have auto command complete features for nmcli utility. 1. Identify the Network devices. 2. Activate/Connect the Network devices. 3. Establish the Network connection with proper type. 4. Assign the IP Address as per the requirement. 5. Restart the network devices. Step1 : Identify the network devices. Ensure the network card which doesnt have ip address or card which need to be change the ip address as the image shows. Above image shows, we identified our card as ens33 but it is disconnected. So we will connect or activate the network devices. Using nmcli, we will connect the network connection as below to configure ip adresses. Choose the network card and select the proper types (Ethernet, bluetooth, wifi, bond, bridge, team and so on.). Use the below command to establish the network connection. Step 4 : Assign the IP Address as per the requirement. 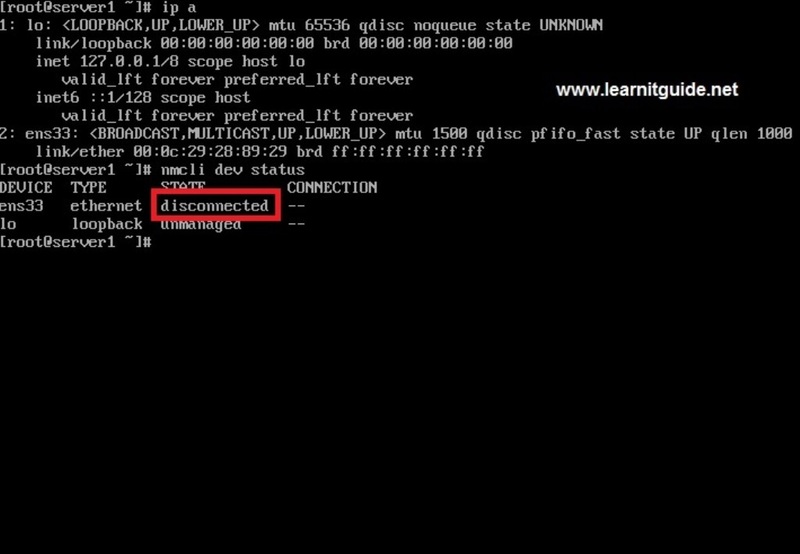 Assign the IP Address to the network card using nmcli and set immediately from dhcp to manual, if not, your static ip will be changed by dhcp after the reboot. If you need dynamic ip, then leave it as it is. Step 5 : Restart the network devices. To get the changes effect, down and up the network interfaces. Verfiy the IP Address. Network configuration on RHEL7 or CentOS 7 is done.